Making marijuana butter is easy. How to make cannabutter in a few simple steps. Making Marijuana Butter. The Quickest Way To Make Marijuana Butter. Making marijuana butter is the core of most marijuana food recipes. Weed butter is the essential ingredient that gives the high in marijuana food, so take your time to learn and make it right. There are a couple different ways to make cannabutter, however, all ways to make marijuana butter are pretty basic. of unsalted butter, not margarine! or more marijuana leaf, less if using buds. 1. 1 Double broiler, or 2 pans one smaller than the other. 2. 1 large bowl, a strainer, a grinder, a cheesecloth or an old pair of pantyhose. Video On How To Make Marijuana Butter At The Bottom. 1. Prepare marijuana leaf or bud. You can crush or grind your marijuana leaves using a clean electric coffee grinder for ease, or you can do it by hand with a bud grinder or with your hand. The more the leaf and bud is ground the easier it is for THC extraction. 2. If using two pots, add water to the larger bottom pot and put your butter in the smaller pot. Set the small pot in the big one and heat on low until butter is melted. 3. When the butter is completely melted add your prepared marijuana clippings to the marijuana butter. Let cook for up to thirty minutes, remembering to stir every five. 4. Remove the bud budder from heat and let it cool until manageable (about twenty min). Now pour your fresh marijuana butter through the strainer into your large bowl, this removes the big pieces of marijuana leaf. 5. More extraction for a nice buttery consistency. If you have a cheesecloth handy this step is easy. If your butter is still hot wear gloves. You do not want to burn yourself. Soak the cheesecloth in the butter, and squeeze into your small bowl used for storage. You can repeat this process to remove more of the marijuana remnants if you feel it is necessary. If you do not have a cheesecloth then we would recommend using an old pair of pantyhose. Cut the foot off the pantyhose and carefully pour your marijuana butter mixture in and squeeze over your small bowl. Your done! 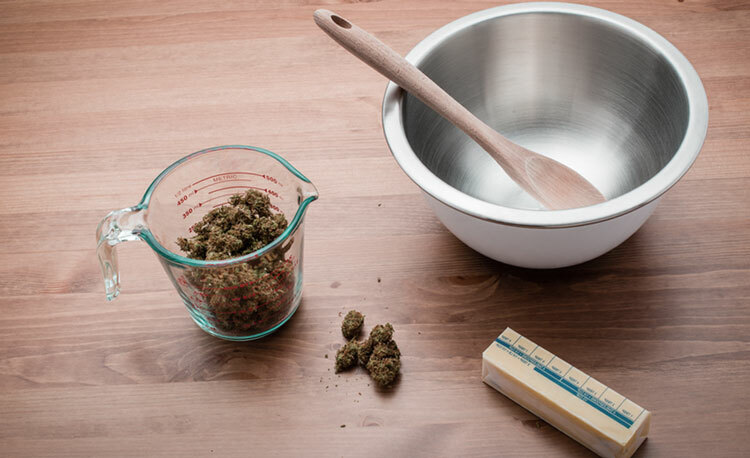 Cover your small bowl and place in refrigerator, or now that you have made cannabutter you should try it in one of your favorite recipes that requires butter, like brownies, cake, or cookies to make your very own space cake.